Selling an inverter is a power electronic device or circuit that is used to convert direct voltage (DC) to an alternating voltage (AC). There are several inverter topologies that exist today, from which only produces alternating box output voltages (push-pull inverter) to those that can produce pure sine voltage (without harmonics). One phase, three phase inverters are up to multiphase and there are also multilevel inverters (split capacitors, clamped diodes and cascade arrays). Makmur Abadi sells LS Inverters of high quality at low prices. 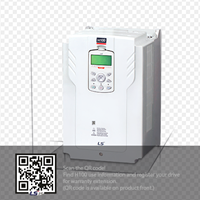 Inverter iC5 LSThe inverter is a device that is the opposite of the adapter. Adapter, for the uninitiated, this type of Inverter and Converter is useful for converting AC current (back and forth) to DC current (unidirectional). Inverter S100 LSHigh Performance Standard AC DriveStrong sensorless control, and a variety of user friendly functions provide added value to our customers.SMALL SIZEThe main sections are optimally managed inside through the use of thermal radiation analysis and 3-dimensional design to reduce dimensions by up to 60% (volume-based) compared to previous products (iG5A)SENSORLESS STRONG CONTROL200% / 0.5Hz torque derivatives are generated and provide strong power in areas with low speed.SELECTABLE ROTARY / STANDSTILL AUT-TUNINGStandstill auto-tuning is equipped to find motor constants without rotation in conditions where the system is plugged in or the motor can not be rotated.FLYING START FUNCTIONThe inverter is capable of performing smooth, reliable looping into bi-directional rotational loads.REACTORS OF BUILT-IN REACTORSEffective in increasing power factor and lowering THD.3-phase 400V 30 ~ 75kWBUILT-IN EMC FILTERMeet the electrical noise reduction regulations. Related standards: Standard 2 Environment / Category C3 (Class A) CE certifiedC2: 1-phase 200V 0.4 ~ 2.2kWC3: 3-phase 400V 0.4 ~ 75kWGLOBAL COMPLIANCE (UL, CE)Global standard complianceUL, CE, Gost, C-tick and cULGLOBAL COMPLIANCE (UL, CE)It is designed to choose between heavy and normal duty operations.Capacity overloadedHeavy duty operation:150% rated current, 60 secondsNormal task operation:120% rated current, 60 secondsDIFFERENT FIELD NETWORKSAble to handle various field field Easy maintenance and installation.A wide selection of field busesProfibus, Ethernet IP, Modbus TCP, CANopen Easy to install and useBUILT-IN SAFETY TORQUE OFF (STO)The safety input function meets EN ISO 13849-1 PLd and EN 61508 SIL2 (En 60204-1, stop category 0).This feature is equipped and lets you meet current safety standards.REPLACEMENT OF SIMPLE FAN COOLINGFan replacement without complete disassemblySMART COPIERSmart photocopiers allow users to download & upload parameters from / to S100 without AC input power.The main customized firmware can be downloaded into S100 using Smart Copiers.The main control firm and I / O stored in the Smart copier can be downloaded to S100MULTI-KEYPAD FUNCIONA single LCD button can be used to adjust the RS485-connected drive parameters.The LCD keypad (same as the iS7 model) is used to manage parameters easily. Parameters can be copied to other drives.Multi-language support will be available.CONDITION OPTIONSS100 meets type UL 1 with this option.BAD OPTIONSS100 allows heatsinks installed outside the panel for a better cooling system with this option. 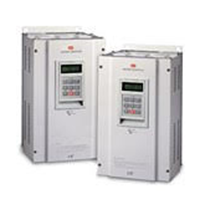 Inverter IP5A LS5.5-30kW (7.5-40HP) 3Phase 200-230 volts5.5-450kW (7.5-600HP) 3Phase 380-480 voltsVFD Starvert iP5A series made to take on some of the standard functions required for Fan and PumpFeatures:Dual PIDIf you need more PID control or Cascade PID control, Dual PID can be useful for systems that only use iP5A.Multi Motor ControlThe Algebra control function can make the inverter to control many motors without controller and the user can save both cost and also the electricity used.Sleep and Wake-Up FunctionThe Inverter and Energy Converter functions make the inverter stop automatically when the capacity is very low.Pre HeaterThe Pre Heater function is designed to prevent damage to the motor and damage to the inverter due to moisture.Flying StartWhile the inverter is connected to many ventilators or fans on a large moving system load due to natural convection, iP5A can adjust the motor and change the speed automatically.Auto energy savingiP5A provides an energy saving feature automatically with optimum flux control function that reduces the waste energy.Instant Power-off and Power Dip GenerationWhen power Dip or instant power-off, which is generated by using light, ground and konslet, the machine keeps the energy and energy will return to the inverter. Conslet time will decrease if using this inverter.Constant and Stable Performancel (24 hours 365 days)Even in bad weather or bad conditions, iP5A can control the motor and engine with the best performance.Safety StopWhen the konslet occurs, the inverter will stop the motor using intertia energy which will prevent the future konslet. 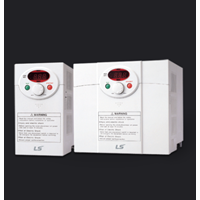 Buat Permintaan Untuk "LS Inverter"
Inverter iv5 LSVFD LS Starvert iV5 series can realize high precision on vector control in all operational parts and high speed control delivers outstanding control stability.Features:Auto tuningIf high rotation is required at low speeds, electrical parameters on the motor must be well prepared for optimal operation. This feature will facilitate the user in managing the motor accurately.Multiple communication viewsThe inverter and iV5 Converter provides several communication displays such as RS 485, DeviceNET, Profibus-DP and Modbus-RTU.Extended function card (ENC_DIV, DIAO and ELIO)The option card for the pulse division encoder (ENC_DIV) supports the encoder with the collector output and can divide the encoder pulse up to 1/128. Digital input and Analog signal output card can receive command from PLC or other high level controller and there are 4 channel output from analog signal. The ELIO card can facilitate the application of elevator software for other elevator operations. 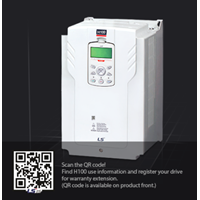 Inverter H100 LSFan and Air PumpKEYPAD EXCLUSIVE FOR HVACUsed to issue commands, configure drive parameters, and to monitor drive status- HAND mode (Local, Control, Mode) or AUTO Mode (Remote Control Mode) can be selected.- HAND mode:Inverter and Converter Used when selecting frequency or run / stop command.- Automatic mode:Drive is operated using the keypad. multifunctional terminal blocks and their communications- Status Error MonitoringOPTION SPECIFICATIONS (CONDUIT KIT)Acquired UL open type & attached type 1 certification- When channel selection is used, the drive meets UL Enclosed Type 1 specificationTYPESIf the space is too small, the heat sink can be installed outside the panelCOMMUNICATION MODULERS-485's built-in capabilityModbus-RTU, Metasys N2BACnet MS / TP is embedded as standardLonWorks options can be addedCOMMUNICATION MODULEEasily replace the cooling fan without opening the drive coverDC REACTORSBuilt-in DC Reactor is effective for improving power factor and reducing THD.The DC reactor is built-in as standard for 400V 37-90kWBUILIT-IN EMC FILTERFiter EMC built-in to respond to specifications for noise reduction400V 0.75 ~ 30kW Built-in as default (C3)Options 400V 37 ~ 55kW Built-in can be selected (C3)75 ~ 90kW meets EMC specification even without filter.GLOBAL SPECIFICATIONS STATEMENTSUL Plenum Rated (American standard for fire safety conditioner)suitable for installation in Compartment Handing onditioned AirSMART COPIERPowerless operationLED inputRead / Write ParametersEasy InstallSIDE-BY-SIDE INSTALLATIONThe size of the control board is significantly reduced when multiple drives are installed by minimizing the distance between installed products.The Sibe-by-side installation is not available for 37 ~ 90kW.REDUCED SIZEThe Main Components are optimally used through thermal and radiation analysis3D design to reduce size by 34% compared to iP5A (volume based). 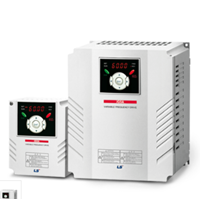 LS Industrial System is the next generation industrial automation solution that provides optimal results, both performance and energy efficiency. 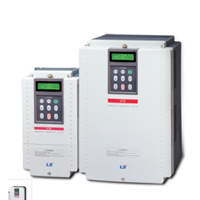 LS inverter is ideal for controlling the speed of a machine tool, fan or conveyor system. Selling various LS brand Inverters such as: S100 LS Inverter, LS IC5 Inverter, LS IP5A Inverter, LS IG5A Inverter, LS IV5 Inverter and LS H100 Inverter.